Chow Chow Characteristics: The faithful and reserved Chow-Chow is a breed of medium sized dog, classified as a member of the Non Sporting Dog Group (AKC:1903). The Chow Chow, is characterized by its sturdy, lion-like appearance with a large, broad, maned head and dignified expression. Other characteristics include a blue-black tongue, dark brown, medium sized, almond-shaped eyes; pricked ears with rounded tips, a compact, square body and a short and stilted rear gait. 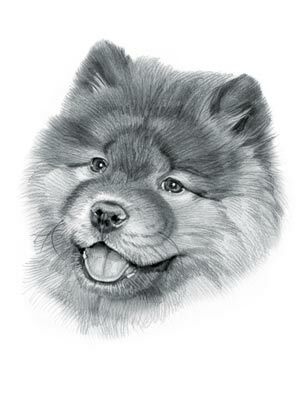 The temperament of the Chow can be described as Loyal, Detached, Intelligent. The coat type of the Chow is described as long: rough or smooth coat in assorted colors. Due to its characteristics and qualities, the Chow demonstrated the desired traits of a Hunting & pointing dog and is known by its nick name the "Black Tongue Dog". The origin of the Chow Chow dog breed was in China where it was developed in the Ancient Times. Chow Chow Breed Group and Dog Type - Non Sporting Dog Group (AKC:1903): The Chow is one of the many breeds of dogs that belong to the Non Sporting Dog Group (AKC:1903). Other names for the Chow Chow: The Chow is known by the nickname of the "Black Tongue Dog". Other names for this breed of dog include the Chow-Chow and Chowdren. The breeds name in Chinese is "Songshi Quan" which translates as "fluffy lion dog". Origin of the name: The origin of the name "Chow-Chow" derives from from Chinese pidgin English word 'chow-chow' meaning "food" suggesting a link to the dogs being seen as as edible in difficult circumstances. Chow Chow History and Origin: The country of origin of the Chow breed was in China during the Ancient Times. The Chow originated in Asia at least 2,000 years to the Han dynasty of China (206 BC–220 AD). Its role was that of a sporting dog, used by Chinese emperors and aristocrats to hunt birds such as partridge and pheasant. As a Hunting & pointing dog it was trained to direct (or point) the hunter to the quarry allowing the hunter to use weapons or nets to catch the birds or animals. It was also used to guard livestock, and, in winter, to pull sleds. The first dogs reached England in the 1800's and its popularity increased when Queen Victoria obtained one. The breed belongs to the Spitz type dogs and retains the distinctive high carried bushy tail that curls up and over the dog's back and the thick dense coat that is typical of the breed. The Chow also has a distinct leonine appearance with an abundant mane that surrounds its face, much like a lion. The blue-black tongue is another of the Chow's most distinctive physical traits. The dogs were first shown in the US in 1890 and was officially recognized by the American Kennel Club (AKC) in 1903. Chow Chow History - Sigmund Freud: Interest in the dogs increased in 1935 when Sigmund Freud (1856 - 1939) Austrian neurologist and the founder of psychoanalysis revealed that he was using a Chow dog called Jo-Fi to provide clues to the mental state of his patients. Jo-Fi would stay close to quiet, depressed patients but would but move away from patients who were tense. Sigmund Freud also recognized that the Chow had a calming, reassuring influence on some of his clients, particularly children. Chow Modern History: The modern history of the Chow moved on and the breed continues to be used as a Therapy dog and is enjoyed as a family pet and companion. Chow Height: This breed is classified as a medium sized dog. The height to the shoulder of a male dog is 18 - 22 inches (46 - 56 cm). The height to the shoulder of a female dog is slightly less. Chow Weight: The weight of the male in this medium sized dog is 45 - 70 pounds (20 - 32 kg). The weight of the smaller female dog is slightly less than the male. Chow Coat Type: The coat type is described as a long: rough or smooth coat. Chow Coat Colors: The colors of this dog breed consist of assorted colors consisting of black, blue, cream, red, fawn and white. N.B. The word "Blue" is used to describe a cool-toned, metallic gray color. The term "Red" refers to reddish shades of orange, brown, and tan colors. Chow Chow Grooming - LOW Grooming Needs: The dog grooming needs of the Chow are categorized as Low in order to maintain a healthy coat and reduce the risk of skin infections. The limited dog grooming needs of the Chow are therefore considered to be low maintenance, requiring limited attention to grooming with casual brushing and combing. Dog Grooming needs should also include bathing the dog on a monthly basis and making regular inspections of the eyes, ears, nails and teeth. Chow Litter Size: The litter size of this dog breed ranges from 3-6 puppies. Chow puppies for sale can be obtained reputable breeders and from rescue centers. The cost of Chow puppies varies depending on location, pedigree history and the dog breeder. Chow Temperament and personality: The temperament and personality of this popular dog breed is described as Faithful, Loyal, Detached, Intelligent and Reserved. Chow Chow Exercise Requirements: The exercise requirements of this breed of dog are moderate. The Chow requires regular daily exercise consisting of about one hour every day. This medium sized dog has a short and stilted rear gait with strides of a moderate length requiring a steady walking or jogging speed by the owner to meet the dogs exercise requirements. If the dog has more energy than you do, then teach your dog to play ball in a chase and catch game. Chow Chow Diet: A fully grown Chow should be fed twice a day. A diet consisting of a premium dog food can be balanced with fresh food eaten by the family. The question is What Can Dogs Eat?. Check out our comprehensive list of what dogs can and what dogs cannot eat. Chow Health Problems: Potential health problems of the Chow breed include Cataract, Gastric Torsion, Elbow Dysplasia. Resolving health problems can prove to be expensive and it is always wise to obtain pet insurance or dog health insurance when buying a dog. Is the Chow dog breed said to be Hypoallergenic? Answer: No. Chow Lifespan: The life expectancy of dogs vary according to the size, breed of dog and any serious health problems. The typical lifespan of the Chow breed is 12-14 years. Chow Male Dog Names: Male Dog names are most often chosen to reflect favorite names of the owner or the strength, size, coloring and country of origin of the Chow breed. To give you some inspiration regarding good male Chow names our small selection might be of help with naming boy dogs. Our top male dog names are: Shing *** Lee *** Yul *** Jun *** Chen *** Kong *** Sheng *** Liang *** Cheng. Chow Female Dog Names: Female Dog names tend to be softer, prettier and reflect the temperament of the girl dog. Our top choice of good female Chow names are Lixue *** Xia *** Feng *** Ting *** Xiao Chen *** Wan *** Yan Yan *** Mei *** Xue Fang *** Zi.